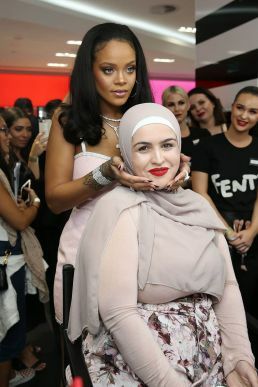 The atmosphere was electric in Sydney as Rihanna celebrated her beauty brand, Fenty Beauty by Rihanna, with Australian editors, influencers and makeup artists. Sydney was the last stop on Rihanna’s Fenty Beauty World Tour after surprising fans in New York, Dubai, and Singapore over the last few weeks. Hosted by Sephora and Fenty Beauty, guests played in a larger-than-life Fenty Beauty world full of fun and immersive brand experiences. Mattemoiselle Plush Matte Lipstick was brought to life with an oversized Saw-C Seesaw inspired by the orange lipstick shade ‘Saw-C.’ She gave the first worldwide sneak peek of her holiday collection with an oversized ‘Chill Owt” Killawatt Foil Freestyle Highlighter Palette that guests could stand in, throwing shimmery confetti in the air for photos to show their perfect highlight. The ‘Chill Owt’ palette is now on sale exclusively in Australia before the rest of the globe launches it beginning October 12th. Following the party, Rihanna surprised clients who were shopping at Sephora’s flagship store on Pitt Street in Sydney. Fans were in awe as Rihanna did makeup touch-ups and took selfies with adoring fans. Sephora, in turn, surprised her with a customized Fenty Beauty surfboard that she signed, and will be given away in the store to one lucky guest in the next few weeks. Check the store for more details. Rihanna was inspired to create Fenty Beauty after years of experimenting with the best-of-the- best in beauty – and still seeing a void in the industry for products that performed across all skin types and tones. She launched a makeup line “so that women everywhere would be included,” focusing on a range of traditionally hard-to-match skin tones, creating formulas that work for all skin types, and pinpointing universal shades.